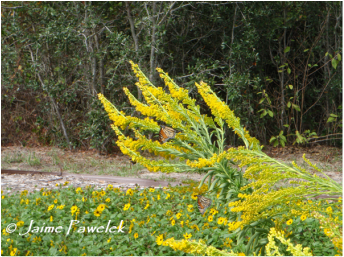 Monarch butterflies visiting a native goldenrod. Gardening for wildlife can be very rewarding, and a garden designed to attract bees will inevitably attract lot's of other critters including butterflies, birds, and beneficial flies and wasps as well. With the right plants and knowledge of how and when to plant them, your garden can be buzzing in no time. Observing bees as they flit from flower to flower can be very entertaining especially when you begin to see differences between the behaviors of males and females. If you don't have room to build and design a new garden to attract bees you can definitely modify your existing garden to benefit them. Imagine your garden from the viewpoint of a bee. What does your garden provide for food? Nesting habitat? Shelter? With the addition of a few key plants and some areas left bare for nesting, your garden can become a haven for winged visitors. Bees need food in the form of nectar and pollen. Nectar fuels their busy days by providing them with sugary energy as they visit flowers and build and provision nests. Pollen provides essential vitamins and nutrients and is mixed with nectar and placed in the nest with the eggs for the larvae to feed on. This pollen and nectar loaf is often called "bee bread". Some plants, like those in the Asteraceae family, provide both pollen and nectar. These composite flowers provide a wide open landing area in which bees can then sip nectar and collect pollen from. Flowers in the Lamiaceae (mint) family typically provide nectar as their reward for visiting bees. Flowers from these two families are favorites of bees, but experiment with natives in your area to see what else they enjoy. Bees will visit your garden for most of the year, except in the really cold months where frosts are common. In Florida, the season can start in late February/early March and go through November if the weather stays nice. It is important to have flowers blooming in your garden during these times and make sure that a source of nectar and pollen is available at all times. As one flower goes out of season another should be ready to replace it so that bees have constant sources of food. Bees are seasonal, which means different bees will be out in your garden at different times of year. Some bees come out in early spring when the first flowers start to bloom, others wait for their preferred flowers and may come out in early summer, late summer or even fall. This is why it is key to have something blooming in your garden at all times. Utilizing plants that are native to your area will ensure that you have many diverse bees visiting your garden. Bees and flowers have evolved together for thousands of years and because of this, native bees prefer to forage from native plants. There are exceptions of course and some non-native plants provide excellent food for bees, especially in times when your native plants are between flowering. 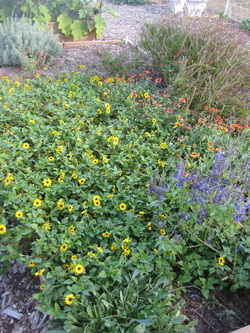 See "Natives vs. Non-natives" for more information and plants that work well for this area. Local nurseries are good places to look for new plants for the garden. Slowly browse the aisles and see if any bees are visiting the plants in bloom, these can give you ideas of what plants might work well in your home garden. Another good way to discover new bee plants is to go hiking in nearby parks or preserves and observe attractive bee plants right in their natural environment. When incorporating plants into your existing garden or when planning the layout of your new garden try to plant large patches of each type of plant. The large patches are more of a draw to visiting bees than individual plants as they like to stick to one or few types of plants when out on foraging trips (this is called floral constancy). Bees won't have to spend time looking for similar flowers and expend energy flying all around if the plants are in big patches. Plus, they are easier to observe and you can watch them hop from from bloom to bloom in a big patch. You might notice a few speedy males actively patrolling their favorite patches of flowers in search of un-mated females, or you might see a female leaf-cutter bee bumping her abdomen up and down on the flowers encouraging pollen to stick to the hairs underneath her. Lastly, it is key to maintain your garden, which doesn't entail too much work luckily. Try to keep some areas of your garden bare for ground nesting bees, light leaf litter similar to what you might find out in nature is alright, but a thick layer of mulch will discourage ground nesters. Refrain from using pesticides and herbicides as they will harm native bees as much as the critter you are trying to discourage. If female bees forage on poisoned flowers they could be feeding that poisoned nectar and pollen to the next generation, effectively sealing their fate. Dead-heading spent blooms (cutting off dead flower heads) is also important as it will encourage plants to bloom for longer thus providing food to bees for a longer period of time. Remember to have fun and happy bee gardening! 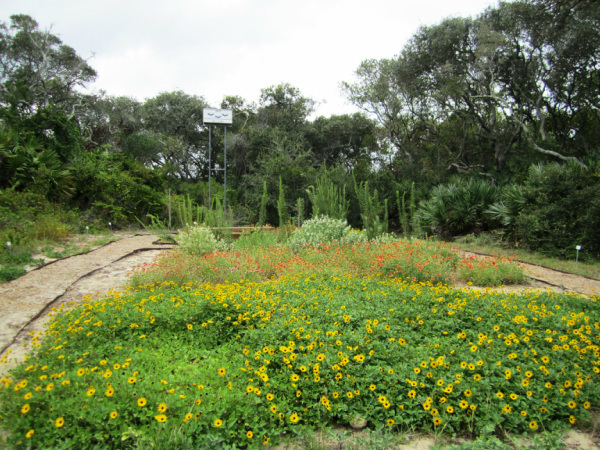 Native plant garden at GTMNERR. Photo by Emily Montgomery.